They’ve had to endure another difficult season at the wrong end of the table but Buckingham Town produced arguably their best performance of the season this week to beat high-flying Bourne Town 4-2. The Robins were hopeful of a more fruitful season but despite impressing in flashes, they’ve remained in the bottom five of UCL Division One for much of the campaign, currently 17th. Against Bourne, a devastating first 15 minutes paved the way to victory as Tariq Kotey finished emphatically on just two minutes for his 14th goal of the season before Sam Folland headed home a second barely 45 seconds later. Buckingham grabbed a third on 13 minutes through Folland’s second as he finished off a fine passing move and it remained 3-0 until the second half when Jonny Rice made it 4-0. 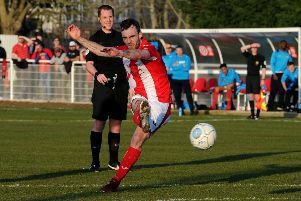 Bourne rallied late on and two goals in the final 10 minutes took some of the gloss of the scoreline but Town were full value for their victory. “Overall it was very pleasing,” said boss Chris Robson afterwards. “At times, especially in the first quarter of the match, we played some great football, probably some of the best we have played all season and scored some superb goals. “We spoke before the game about trying to enjoy ourselves and playing with a smile. “We haven’t had the best of seasons and now realistically we do not have anything to play for so we took the shackles off and told the lads to go entertain and enjoy it. “In recent weeks, although we have been getting some result, we’ve been very direct trying to be solid and defensively sound before anything which has worked but we haven’t been an attacking threat with that style. “So it was pleasing to see us get the ball down and to see our attacking players come back to life and perform as they did. Buckingham host Long Buckby this weekend.